Building professional experiences in conjunction with industry collaborators helps our students find the jobs that they want. In order to prepare students for their future careers, the Master of Science in Analytics program seeks to enhance in-class learning with industry practice. The program provides students with the knowledge and skills to succeed in the workplace by building professional experiences in conjunction with industry collaborators. Getting an internship is a core requirement for the degree. Students who have reached the internship phase of the program should have completed three quarters of coursework and should be motivated to apply their skills to a professional setting. Interns may be employed to undertake discrete projects or to supplement resources of existing teams. Twice in the curriculum, students engage in applied projects provided directly from industry. Working under the guidance of business and technical advisers, a team of four or five students work together to provide the most effective and efficient solutions for the client while crafting demonstrable analytical skills. Practicum projects are expected to last eight months, and capstone projects are expected to last ten weeks. Classes in the Master of Science in Analytics program rely on a wealth of data. Providing data sets offers refreshing insight and exposure to otherwise under-used information. Industry leaders visit Northwestern to lecture in a class about a topic or issue in which they have particular experience. For students, opportunities to interact with established professionals in these settings are of immense value. 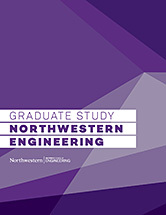 Organizations and individuals may speak at, and participate in, seminars and workshops hosted at Northwestern University by the Master of Science in Analytics program. This series fosters cross-industry dialogue to explore best practices, recent innovations, and common problems in analytics. Graduates of the Master of Science in Analytics will be prepared for immediate employment in a variety of professional environments and will have a robust foundation for building a career. We expect our students to be highly sought after by data-savvy organizations.